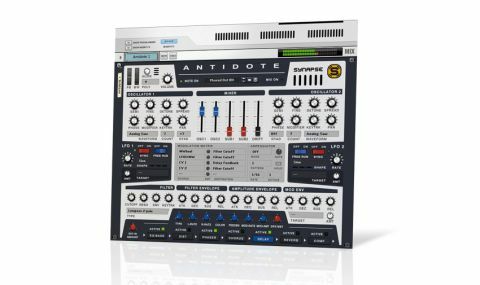 One of the most powerful synths in the Rack Extensions Shop, Antidote is a potent cure for so-so synth sounds. Big sound. Zero-delay feedback filters. Extensive list of mod destinations. Great arpeggiator. Good range of back panel I/O. Can be CPU-hungry. Some presets have too much effects. Although Propellerhead's Reason is often presented as a dance/electronica-oriented software studio, its own built-in devices aren't always so obviously identified as such. Synapse Audio's new addition to the fast-growing collection of Rack Extensions, Antidote has 'dancefloor' written all over it. "With the ability to pile up to 800 (!) oscillators into a massive unison cacophony, we have little doubt that dance producers are the intended recipients of this particular shot"
Sure, it can make a lot of other sorts of sounds, but with the ability to pile up to 800 (!) oscillators into a massive unison cacophony, we have little doubt that dance producers are the intended recipients of this particular shot. Like countless other virtual analogues, Antidote's sound starts with a pair of oscillators. However, these are no ordinary oscillators, rather oscillator banks. Each bank is capable of delivering up to 50 oscillators per voice, and with up to 16 voices of polyphony, that's 800 in total. In stereo! Oh and because - you know - that might not be enough, there are sub- oscillators onboard too. The selection of waveforms is fairly standard, though you do get some oddballs like Ringwave and Sine-triangle, and the version 1.1 update brings wavetable synthesis into the equation. Filtering is another strong point, with seven modes on offer, including five flavours of low- pass alongside band-pass and high-pass options. The low-pass filters include a nifty diode version - ideal for 303-style basslines and squelchy VCS3-a-like patches. The filters are of the zero-delay feedback design, for a more authentic analogue sound. After that, it's pretty familiar stuff. You get a pair of LFOs with the usual shapes and modulation targets, and you can sync them and set them to free-running or triggered. There are three four-stage envelope generators: one dedicated to amp, one to the filter and the third an assignable mod source. On the subject of modulation, the mod matrix gives access to 22 sources and a hearty 60 destinations. A few of these sources come in from the back panel, where you'll find External inputs, Sequencer In and Arpeggiator Out jacks, along with a quartet of CV inputs. The arpeggiator, while we're on the subject, offers the usual playback modes and a library of preset patterns. Obviously, Antidote is a synth to be reckoned with. If we have one complaint about it, it's a familiar one: the built-in effects (particularly the reverb) are slathered a little too liberally all over the otherwise brilliant presets. Yes, we know that effects are a crucial and integral part of modern sound design, but nothing shoves an 'in your face' patch into the background quite like heavy-handed reverb. Thankfully, Synapse has included individual bypass buttons for each effect right on the main panel, so it's easy to deactivate them to see if they're really beneficial to the sound - shutting down that reverb drops the CPU usage in a hurry. Don't get us wrong - the effects are great and have some really cool features, but with power comes responsibility. That aside, Antidote is a fantastic synth with a fantastic sound. It's sufficiently different from Reason's included instruments to warrant a look if you want a bit more oomph than that provided by the stock instruments. Although one of the more expensive items in the 'Prop Shop', if you're making dance music, you'd be crazy not to give it a go.